I had been looking forward to The Hunger Games for a long time, ever since I read the first book in the trilogy in February 2011, when buzz about the film adaptation was just starting to build. The movie does not disappoint, though it seemed like a bit of a "Cliffs Notes" version of the book, even with its 2 hours and 22 minute runtime. Fans of the book will ultimately like this film, and it's able to stand on its own two feet for those who have not read the novel; however, those who read the book will definitely have an easier time understanding the story. Katniss Everdeen (Jennifer Lawrence, X-Men: First Class) lives in District 12 with her mother and sister, Prim (newcomer Willow Shields). For a long time now, there has been twelve districts; at one time, however, which the film only alludes to, there were thirteen - District 13 decided to revolt against the Capitol, the ruling power, but lost. Because of this "war," as a propaganda video says, we have the Hunger Games each year, in which two tributes from each district, one boy and one girl ages 12 to 18, are selected to go to the Capitol and engage in a battle to the death. Katniss and her hunting partner, Gale (Liam Hemsworth, The Last Song) always live in fear of being chosen for their district at the Reaping each year, but she assures Prim that her name won't be chosen; her name has only been entered once this year. Unfortunately, that's exactly what DOES happen, and Katniss volunteers herself to go in Prim's place, knowing that Prim wouldn't be able to survive - Katniss, with her bow and arrow skills, at least has a shot at it. The boy chosen for district 12 is Peeta Mellark (Josh Hutcherson, Journey 2: The Mysterious Island), whom Katniss has known all her life; Peeta once showed her kindness when she was starving. Peeta and Katniss travel to the Capitol, where the people are fashion-obsessed and the skyscrapers are plentiful and shiny, and they are soon thrust into the Arena to fight for their lives. I am a huge fan of The Hunger Games series, and I have heard that the actors in the movie have signed on to do all three films if this one does well at the box office, which I'm sure it will. I'm also very glad that I've read the books, because there were some holes in the movie that I was able to fill in with my knowledge from the novels. The movie briefly touches on the fact that Katniss's name has been entered in the Reaping multiple times because she needed food for her family - extra food was available for those willing to risk their lives on it, so to speak - and Gale notes his name was entered about forty times. Another example is when Katniss befriends a young girl named Rue (Amandla Stenberg, Colombiana) in the arena and the book mentions that she reminds her of Prim; this is shown rather than told, by Katniss's actions, once tragedy befalls them. There are other parts of the book, too, that were either cut out or only quickly shown on screen. At the end of the day, however, the movie definitely excels on its own, and must be judged separately from the book. My favorite characters were actually the evil ones: Donald Sutherland (Horrible Bosses) as President Snow, the leader of Panem (essentially a future North America), and Wes Bentley (Gone) as Seneca Crane, the "gamesmaker" who is in charge of running the Hunger Games and choosing what to show the audiences watching it on TV. The acting by everyone in the cast is superb, though, and I especially enjoyed the performances by Jennifer Lawrence, Stanley Tucci as TV host Caesar Flickerman, and Josh Hutcherson, who was much more charismatic than I had expected Peeta to be. Yes, see this film. I do recommend reading the book first, or perhaps even afterwards if you want to broaden your knowledge of the districts and Panem. The other two books in the series, Catching Fire and Mockingjay, are interesting reads as well, though I remember that Mockingjay was not my favorite of the three. It will be interesting to see if audiences will become as obsessed with The Hunger Games as they were with Harry Potter series and Twilight; but regardless, we have a new heroine to cheer for in Katniss Everdeen, and I hope to see more of her on the big screen soon. 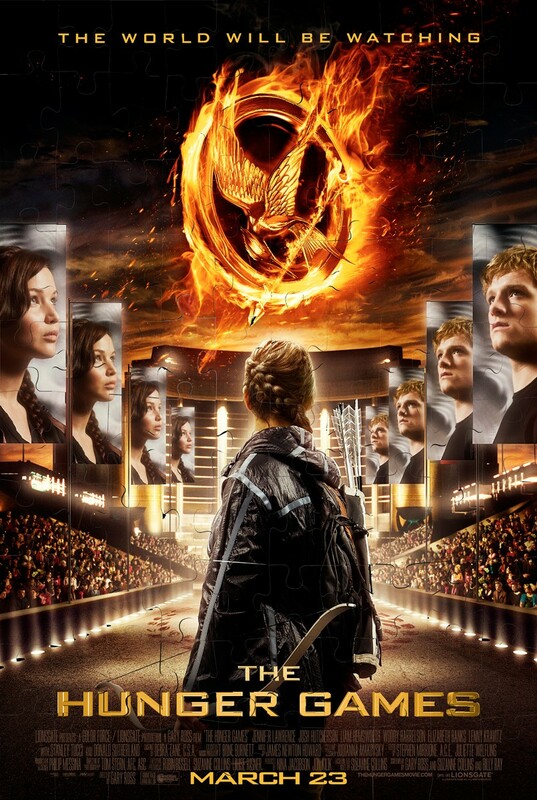 The Hunger Games is in theaters today, March 23rd, and is rated PG-13 with a runtime of 142 minutes. 4 stars out of 5. I definitely will give this movie a watch. read the first book, and i am already halfway through the second book. No - it is not. The violence is done "tastefully" - the hand-on-hand scenes are a blur, and in most cases violence is just suggested. The first thing we see in terms of this is when they are showing footage from last year's game and there's a kid with a bloody brick, and we see another kid lying on the ground dead - I don't think we actually see him hit the other with the brick. So excited to see is!!! I don't get to see it until next week unfortunately, but am so excited!! I heard that many people have said that it will break "Breaking Dawn"'s record at the box office! I hope it does :) I think the quality of the film is better than most of the Twilight ones, though I do like the Twilight films too.